and complex designs all wondrously made, and leg greaves of supple tin. in haste to deliver the flashing gear bestowed by Great Hephaistos. With a warriors’ instinct, Achilles shrugs and flexes, jumping and dodging, pivoting and testing both fit and balance, finding his new armor as light as wings. Swearing he will not halt this day until he has made all the Trojans sick of war, Achilles races onto the field of battle with a great shout, driving his team of well-bred war horses straight into the front line, in search of Hektor. However, it is Aineas, who will one day be famous for founding the city of Rome, that steps up first to face Achilles.2 Behind Aineas, every Trojan’s knees are trembling at the sight of Achilles flashing like the fearsome war god, Ares. Dueling warriors depicted on an Attic Black-figure Neck Amphora, ca. 550 BCE. Exchanging proud words of warning, Achilles and Aineas are each determined to gain honor at the expense of the other. Then, Aineas drives his spear into Achilles’ shield and a loud clanging noise resounds upon the impact. Achilles grips his shield strongly, holding it out from his body in case the spear might drive through it, but this is unnecessary. Constructed of five layers, the spear pierces the two outer layers of bronze, but the middle layer of thick gold deflects the ashwood spear of Aineas. 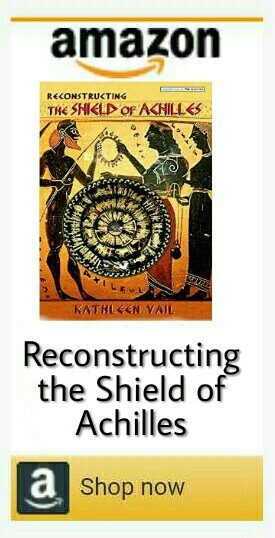 Next, Achilles hurls his spear and hits Aineas’ shield where it is thinnest, sending up a sound of screeching as the spearhead strikes the plate. Horrified, Aineas leaps back, deflecting Achilles’ spear by squatting low and holding the shield high. Bouncing up and over Aineas’ back, the spear buries itself in the battlefield. Still crouching, Aineas rises, carrying up a huge boulder to crush his enemy as Achilles closes in on him with his glittering sword thirsty for blood. Sometimes miracles are more timely than others, and this is the perfect moment for a miracle. Ensuring Aineas will survive to achieve a far greater fate, Poseidon blows a battle-haze of confusion into Achilles’ eyes, helping Aineas escape. The haze in his eyes dissipates away from Achilles when Aineas is safely away. Retrieving his spear, Achilles swears resentfully at the lost opportunity. Perceiving that Aineas has been helped by the gods, Achilles swears Aineas to hell and turns his attention once again to the front line. Goading his men to increase their bravery, Achilles swears that he will fight the whole war by himself.3 He and his soldiers roar as a pack of lions, charging the Trojans and breaking through their front line at the same moment that Hektor is reentering the fray. Attic Black-figure amphora ca. 570 BCE. With a heart-stopping shout, Achilles rushes into the midst of flashing bronze, flying hooves, and pivoting war carts. Swords and spears are thrusting in every direction and blood sprays from both beasts and men. The first Trojan to reach Achilles receives his head split in two. Achilles cries out happily, as though singing.4 Piercing the second man’s skull with Achilles’ spear, the Trojan’s brains and blood explode from his helmet. A third soldier panics, turning to run away, but Achilles pulls his spear from the skull of his last enemy and coldly drives it into the back of the cowardly Trojan. Attic Black-figure Amphora ca. 530 BCE, Depicting horses trampling a warrior. Next, Polydoros speeds past Achilles. The young son of Priam is known as the fastest runner of the Trojans, but his speed is not enough to save him today. Achilles casts his spear, hitting the young prince in the back. The hungry spear buries itself in Polydoros’ body, piercing all the way through and poking out from his navel. Amid the horrific cries of the dying Trojans, Hektor spies his young brother dying at the hand of Achilles. Raising his sword while shouting and running, Hektor flies out of control like a raging fire. Startled by the wild shouting, Achilles sees Hektor approaching and prays to the gods, knowing it is his time, his opportunity for revenge.5 Yelling at Hektor, he urges him to run straighter, in order to meet his fate sooner. Hektor is unafraid, responding that perhaps he will kill Achilles because fate is decided by the gods. Throwing his spear murderously at Achilles, Hektor is astonished to find the spear returned, landing in front of his feet. As well, Achilles lunges three times at Hektor, stabbing powerfully with his spear, but in vain. And, on the fourth lunge, Achilles discovers that Hektor has vanished! More enraged than ever, Achilles pushes forward, butchering every Trojan in his path. Flashing and slashing right and left, Achilles tramples the falling soldiers under his horses’ hooves as he advances through the enemy lines, inflicting mayhem and bloody slaughter. Flushing his enemies down to the bank of a river, Achilles leaves his spear beside a tree and wades into the fray, butchering all by his sword until he tires.6 Then, taking a break from his mad slaughter, Achilles captures alive twelve Trojans. He uses their own belts to tie their wrists behind their backs and, reserving them to burn on the funeral pyre of Patroklos, he sends his prisoners back to his camp with one of his captains. Reclaiming his spear from beside the tree, Achilles again throws himself back into battle. Although the young man begs Achilles to spare him, the beloved of Patroklos swears he will kill every man that heaven puts in front of him. Encouraging him not to be such a coward, Achilles tells the Trojan prince to look at him – born of a king and a goddess, but death is awaiting him, too, such is fate. The time will come and death will come by a spear throw, or maybe an arrow. Slumping to the ground without another word of warning, one more son of Priam eats the spearhead of angry Achilles. His next opponent throws two spears at once at Achilles.8 The first spear hits his glorious shield, deflecting off the gold. The second spear nicks his right arm, delivering Achilles’ first wound and causing his own throw to miss. Drawing his sword without hesitation, Achilles lunges and slashes, opening the man’s belly and then strips the armor off the dead body. The water’s strong currents flow under his feet, surging and pushing Achilles off balance, but he finds the strength to keep running. Then, accompanied by huge blasts of wind from the sea, fire breaks out all around him in roaring gales. Every green thing not yet flooded goes up in flames, and the water begins steaming and boiling. Rebuffed by the battling fire, the waters reside in answer to Achilles’ prayer for help. With Achilles once again in hot pursuit behind the Trojan soldiers, they stream into Troy as the gatekeepers open the gates. Hoping to help the others escape, one more Trojan stands to face Achilles.10 Throwing his spear, it hits Achilles’ shin, but his leg greave deflects the danger. Then, racing away, the Trojan opponent turns into Apollo, although this fact is hidden from Achilles. Racing close behind, Achilles pursues his enemy into the dusky shadows of Troy while Trojans in mortal fear are able to flee the battleground for the safety of the city. Preferring glory, even at the price of death, Hektor ignores the pleas of his mother and father shouting down to him from the towers above the wall. Achilles closes in on him and, at the last moment, Hektor sprints away, running like a deer in fear for his life, alongside the walls, away from the city gates. Achilles runs light-footed, never tiring, like a chariot horse trained for the races. Three times around the town they race along the walls, with Achilles never gaining on Hektor, and Hektor never gaining greater speed. Finally, in the fourth round, Hektor turns and faces Achilles, hoping to end this nightmare of running and running and going nowhere fast. Hektor promises Achilles he will not dishonor Achilles’ body if he kills him, and hopes for Achilles to promise the same. But Achilles swears there can be no promises between man and beast, nor between wolves and sheep. He swears he will kill Hektor for all the men that Hektor has killed, and he hurls his spear at Hektor. Ducking expertly at the moment of Achilles’ cast, Hektor escapes the danger. Planting his feet solidly, Hektor then throws his spear, watching in horror as it bounces off Achilles’ shield, far beyond Hektor’s reach. Attic White-ground Lekythos Depicting Achilles dragging Hektor’s body, ca. 490 BCE. Knowing that his end is now nearby, Hektor pulls out his sword, swinging with all his strength, but Achilles draws his shield close. Straight through the neck, Achilles drives his spear, and Hektor drops to the dirt. Still able to speak, Hektor begs Achilles to have mercy on his dead body. He prophetically warns Achilles to take care, in case Achilles angers the gods and they allow Paris to bring him down by an arrow from Apollo. But Achilles tells him to shut up and die, yanking the spear from Hektor’s throat. He swears he wants to butcher Hektor and eat his body raw, for all the pain that Hektor has caused him. Achilles then strips the armor off of Hektor, reclaiming it back to himself, and Greek warriors step in close to stab the body of the fallen Trojan prince. With Patroklos’ death avenged, now Achilles wishes to attend to his burial. Piercing Hektor’s tendons between heel and ankle,13 (an uncanny reference to Hektor’s ‘achilles’ tendon?) Achilles runs a leather strap through both, tying the body to his chariot. As Achilles shakes the reins and shouts his team into a run, screams rise like flames of fire from the walls of Troy as all see the Prince’s body defiled and dishonored, dragging through the dirt behind Achilles’ war cart. Upon returning to the ships, Achilles does not dismiss his men.14 Instead, they drive their war carts past Patroklos, mourning him one by one, paying their last respects to his body. Three times they drive their teams around the body of Patroklos, with cries of grief rising as though from one voice. After slaughtering beasts for the funeral feast, the Greeks disarm and return to the feast. But not Achilles. Giving orders for the following morning, for the funeral pyre of Patroklos, Achilles then drops in the sand near the water’s edge, weeping until he sleeps. Patroklos visits Achilles all night in his dreams, making requests of Achilles and begging him to bury him quickly.15 Upon awakening, still weeping, Achilles turns to the task of building the huge pile of wood, that, once burned, will be the site of the burial mound he knows he will share with Patroklos. By nightfall all is ready, and the funeral pyre of Patroklos keeps burning all night long. Achilles, all the while groaning and crying, tends the fire with loving care. Holding funeral games next, Achilles awards the winners prizes for chariot racing, boxing, wrestling, running, sword fighting, throwing a boulder of iron, and archery marksmanship. For the next twelve days, Achilles sleeps fitfully down by the shore, rising at dawn to drive his chariot three times around the burial mound of Patroklos, still dragging the body of Hektor. The gods protect the dead body from being damaged, but Achilles’ brutal treatment begins to offend them. Finding that the balance of favor is beginning to slip from Achilles, his mother brings him warning from Olympos.17 Obedient to Thetis’ advice, Achilles agrees to give back the body of Hektor to King Priam in return for gifts as ransom. Kylix interior depicting King Priam entering Achilles’ hut to ransom Hektor’s body. Crying in the dark to Patroklos, Achilles fears the anger of his best friend and prays for his understanding. Returning back inside, he orders food for the King, and together they share the first meal either has eaten since the death of Hektor. Taking his hand, Achilles promises Priam that he shall suspend the war for eleven days, as the King requires, for the proper burial of his son. The last mournful voice of the epic is Helen’s, the beautiful kidnapped Greek wife of Paris, who brought all this trouble to Troy. She weeps for herself and her brother-in-law, Hektor, who in all of Troy was her only friend. Here the story ends, not with the death of Achilles, but with the funeral of Hektor. As Priam warns his people, however, the war is not yet over. With the dawning of the coming twelfth day, Achilles will rise again, delivering fresh fire to Troy with his army of untiring soldiers. The Iliad is over, but blood still beats in Achilles’ veins. Achilles’ divine armor is still on his body, flashing in the sun and striking terror in the hearts of the Trojans. What is the end of the story, the end of Achilles? Where will we search for his armor? Homer relates that High King Agamemnon returns home from the war only to be murdered by his wife and his adoptive brother, who has seduced Agamemnon’s wife in order to steal the throne. Agamemnon’s soul is delivered to Hades, where he meets his greatest captain, Achilles, together with Patroklos and others. Achilles greets Agamemnon, offering compassionate words regarding the King’s ill-fated death, so shortly following the time of his greatest victory at Troy. Achilles states that he wishes Agamemnon would have died at Troy, so that all the soldiers could have mounded up a high burial grave, preserving high honors for Agamemnon’s son. “Well-fated hero, Peleus’ son, so much like a god full of glory. Across the ocean from Argos you died, outside of the Trojan town. Over and around you the soldiers slashed, fighting to the death for your body. …”Finally, a storm forced us back to the ships, and we carried your body with us. Your well-formed limbs we washed and rinsed, in a bath of warm, fresh water. Then after anointing your skin with oil, we laid you upon your bed. Like rainfall fell the hot tears of captains, who cut off their hair in grief. mortal men, goddesses, and nymphs. around your body we laid the pile and brought flame to your funeral pyre. turning to ash as captains rode past in their war carts and wearing full armor. Every foot soldier followed in rank, single file, saluting your honor. And hot as a fire consuming a forest, the flames burned your flesh away. which you packed with the bones of Patroklos. Just as you ordered, we obeyed, and intermingled, your bones now lie. awarding great treasures and trophies. Every man will remember the meaning of honor by your life, Great Prince Achilles. 1. Homer’s Iliad, Book 19, line 369. 2. Iliad, Book 20, line 174. 3. Iliad, Book 20, line 360. 4. Iliad, Book 20, line 385. 5. Iliad, Book 20, line 420. 6. Iliad, Book 21, line 25. 7. Iliad, Book 21, line 65. 8. Iliad, Book 21, line 160. 9. Iliad, Book 21, line 270. 10. Iliad, Book 21, line 600. 11. Iliad, Book 22, line 105. 12. Iliad, Book 22, line 321. 13. Iliad, Book 22, line 395. 14. Iliad, Book 23, line 5. 15. Iliad, Book 23, line 65. 16. Iliad, Book 23, line 244. 17. Iliad, Book 24, line 135. 18. Iliad, Book 24, line 590. 19. Iliad, Book 24, line 775. 20. Homer’s Odyssey, Book 24, line 26.